I am a man. Forgive me. Now, there are a hundred different ways to start an article, but I thought that might be the best way considering the circumstances. As a man, I suffer from ED — Extremitus Dimwiticus. I have a thick head, and I often stick that thick head in the sand. Let me explain. Every office has traditions when it comes to Christmas, even if that means not officially recognizing Christmas. But that doesn’t happen at Concerned Women for America (CWA). Around here, we embrace the season with great enthusiasm. We throw a party, we decorate a tree, and this year we continued the tradition of decorating the doors along the main corridor. To spice things up, we divided into teams — and truly, what could be better than a door decorating contest? Oh, and the competition was stiff. We wound up with doors covered in elf-yourself montages, pine wreaths, shiny metallic papers — why, there was even a door with mechanical movements incorporated. And then there was my door. My door was assigned to someone else — someone else who had also signed up to work on another door. But that’s okay, because I knew what she was going to do. My door was going to be covered with “Merry Christmas” as it appears in various languages around the world. It was going to be really, really cool. As it turns out, this dear girl didn’t have time to pull it off. So, on the final day of competition, she changed her plans, and a single sheet of deep purple wrapping paper was stretched across my door. 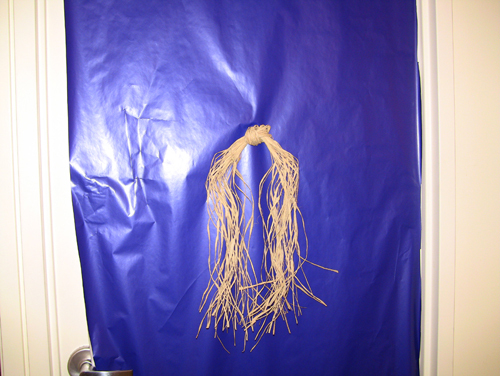 And a single knot of raffia was tied and attached to said door, where it hung limp and alone. And I was hurt. I was angry. I felt slighted. She spent so much time on the other door, and less than 15 minutes on mine. And I stewed over the weekend. And I spoke out of turn on Monday to friends. And I finally asked her if I could redecorate my door. And in doing so, I think I hurt her feelings. But then, something happened: God. … And my wife. Yeah, He does that a lot. Indeed. And she has a point. With the exception of the angel choir’s announcement to the shepherds, the birth of our Lord was pretty low key. … pretty uneventful … pretty simple. A child wrapped in rags, lying in a manger on a bed of hay. And then it struck me, as it’s already striking you, no doubt. As I look down my hall, I see festively decorated doors — bright, flashing lights, metallic wrapping papers, shiny ornaments, jingle bells. And I look at my door, and I think about how we’ve given up bathrobes and wire-coat-hanger halos for canned music, stage lighting, and brightly costumed children. And that’s alright, but it’s too much. And in some respects, it completely misses the point. Sin was a complex problem, to which God gave a simple answer: Jesus. To the world, on that night, Jesus was just a babe wrapped in rags, lying in the straw. But His eyes were crammed full of nobility and royalty. And so now, I wouldn’t change my door for the world, because it’s become for me a symbol of a simple Christmas. A simple straw bow, but behind it, a field of royal purple. The King of Kings, the Son of God, wrapped in humble straw. A reminder to slow down, cut through all the glitz and schmaltz, and see the season in all its simple wonder. I am a man. I learn slowly. Forgive me.